Nawaz Sharif with his brother Shahbaz and father Muhammad Sharif escorting a Chinese delegation. 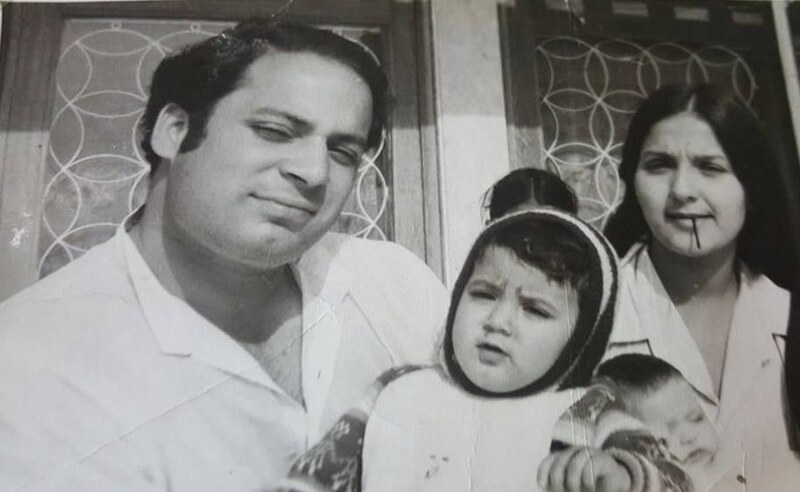 Born on December 25, 1949 in Lahore, Nawaz Sharif is the eldest son to Mr and Mrs Muhammad Sharif. His father was a wealthy industrialist and had founded the Ittefaq and Sharif Group. “The Sharif family is a patriarchal and conservative family. They came to industry in the 1930s, at a time when hardly a few Muslim families had a name in the industry,” says senior analyst Nusrat Javed. “They became futuristic because they came into the steel business. There was one other group, Batala Engineering Company (BECO), and then them [the Sharifs]. Their story is pretty much one of rags to riches… six or seven brothers who came from Jati Umra to Lahore rose because of sheer hard work." Nawaz attended Saint Anthony’s High School for his early schooling before enrolling in Government College Lahore and subsequently obtaining his Law Degree from the Punjab University. "He doesn’t have great friendships from school days. They are from a mohalla called Ram Galla in the Circular Road area," says Javed. "Close to Partition, the family moved to Model Town. He mostly mingled with the neighbourhood boys rather than the boys from his school. His hobbies were cricket, watching films and then driving. In Government College Lahore, he was friends with Khawaja Asif but not many of his good friendships are from school." Nawaz Sharif with his wife Kulsoom. Later, Nawaz joined his family’s influential House of Ittefaq (Ittefaq Group), an industrial conglomerate with interests in sugar, steel, and textiles. He married Kulsoom Nawaz in April of 1971. Nawaz began his political career during a period where many industries, including the Sharif’s steel business, was nationalised by Prime Minister Zulfiqar Ali Bhutto. In 1976, he joined the Pakistan Muslim League, which had a strong footing in Punjab. “When their industry was nationalised by Bhutto, the family took it very seriously," Javed continues. "They began to think of having a spot in politics. They held a grudge against Bhutto. It may sound cynical, but Nawaz’s father pushed him to politics because he didn’t think he would do business." Nawaz was first a part of the Punjab cabinet as finance minister during General Ziaul Haq’s regime and in 1981, he joined the Punjab Advisory Board. According to Javed: "Nawaz had a distant maternal uncle by the name of Hasan who is largely responsible for his grooming in politics. Ghulam Jilani Khan sb made Nawaz Finance Minister in the Punjab government, but he tasked one of his lackeys, Brigadier Qayum, to take Nawaz under his wing." 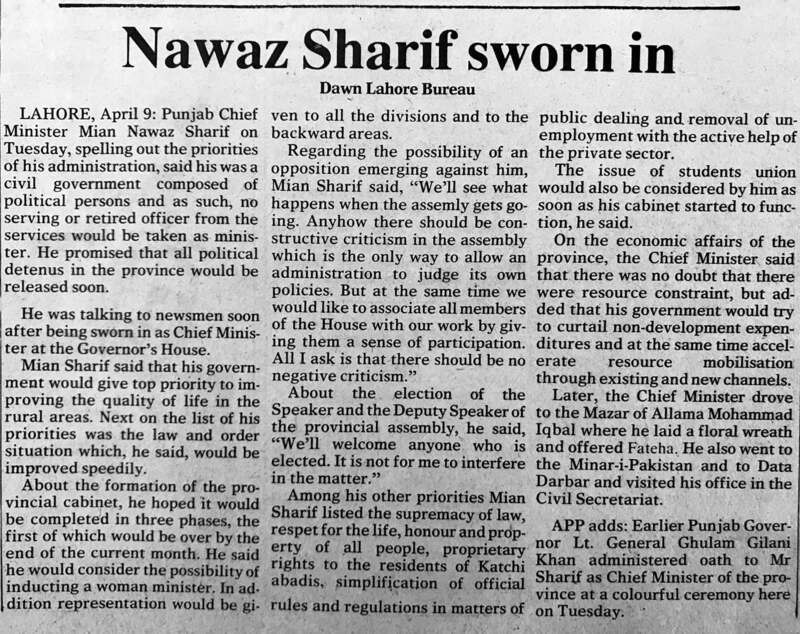 Nawaz was then elected as Chief Minister Punjab in 1985 and was re-elected after the end of martial law in 1988. 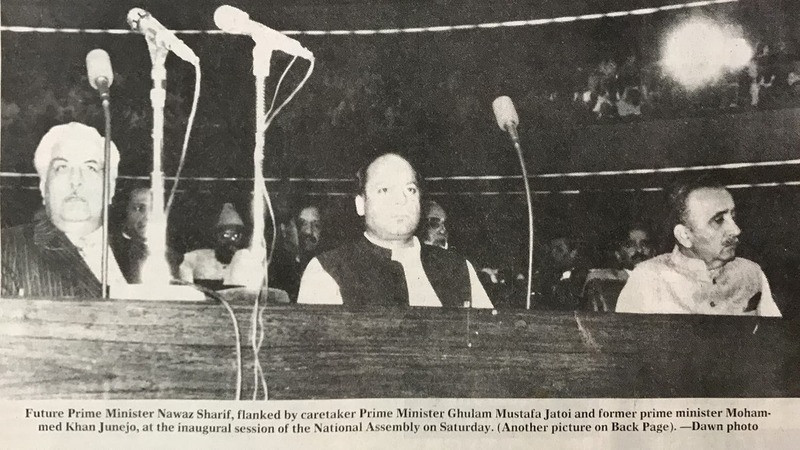 After the death of Ziaul Haq in August 1988, the Pakistan Muslim League split into two factions, with Sharif taking charge of PML, which later came to be known as PML-N.
"Nawaz Sharif was the product of the military establishment," author and journalist Zahid Hussain tells Dawn.com. 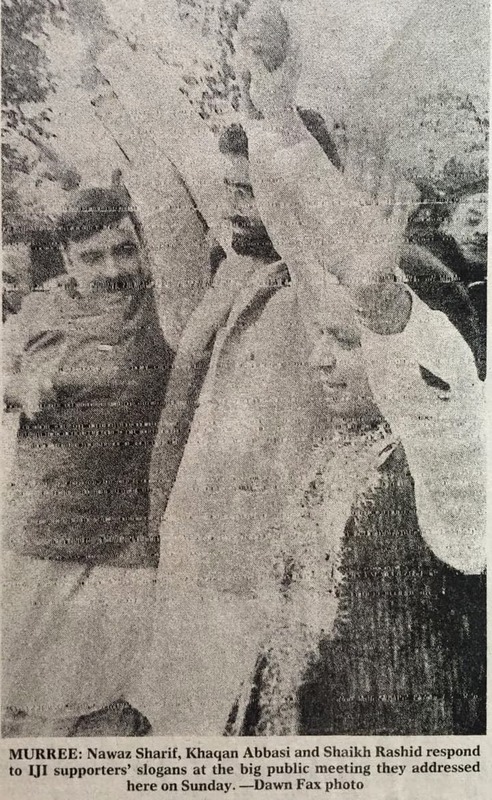 "He was brought into the Punjab provincial government in 1984 from nowhere." "The main objective of Zia’s military government was to prop up an alternative leadership to compete with Benazir Bhutto. He was later made the chief minister of Pakistan’s most powerful province. He represented the trading and business classes of Punjab and owed his political rise with the backing of the Punjabi civil establishment that includes members of the bureaucracy as well as the judiciary." 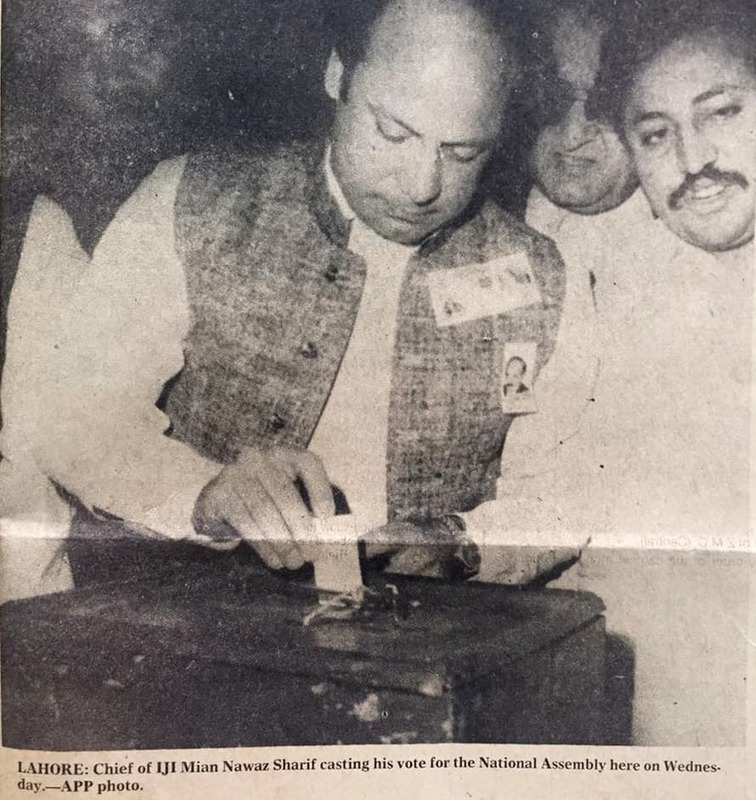 Through 1990, Nawaz campaigned for the general election as chief of the Islami Jamhoori Ittehad (IJI). This photo shows Nawaz Sharif, Khaqan Abbasi and Sheikh Rashid responding to IJI supporters' slogans at a big public meeting in Murree. Hussain says: "Sharif became the prime minister for the first time in 1991 as leader of a right wing alliance known as Islami Jamhoori Ittehad (IJI) put together by the military." "But he soon fell foul with President Ghulam Ishaq Khan as he wanted to accumulate total power. The power struggle led to his fall. A soft coup forced both the president and the prime minister to resign." 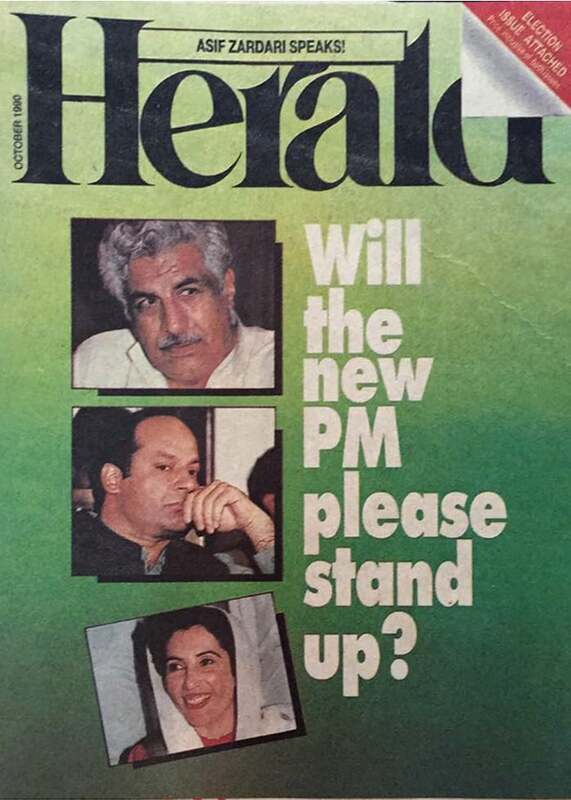 Herald cover on October 20, 1990. Hussain says, "Sharif could not complete both his terms because of his confrontation with other pillars of the state in the first term with the president and in the second with the military. Ironically, it was the same military which was responsible for his political rise." 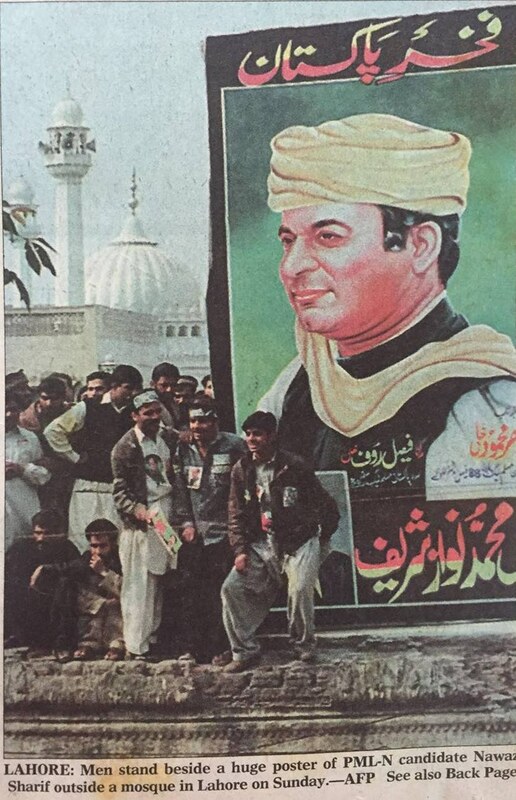 Nawaz was first elected as Pakistan’s prime minister on November 1, 1990. Hussain says, "Shari's victory in the 1991 election against the PPP is owed largely to support from the civil and military leadership." 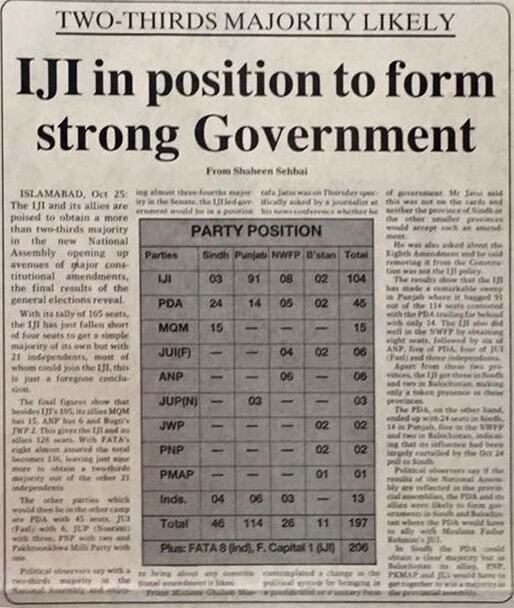 "IJI was created and financed by the ISI — that was confirmed by a Supreme Court ruling in the Asghar Khan case ruling. The military was not prepared to allow the PPP back in the power after the ouster of her first government." During his tenure, Nawaz announced his nuclear policy, which aimed at continuing the development of nuclear technology to meet the country’s energy needs. He also initiated plans for Pakistan’s first mass road network, the Motorway. The Prime Minister’s first term came to an abrupt halt, when President Ghulam Ishaq Khan dissolved the National Assembly in April 1993. 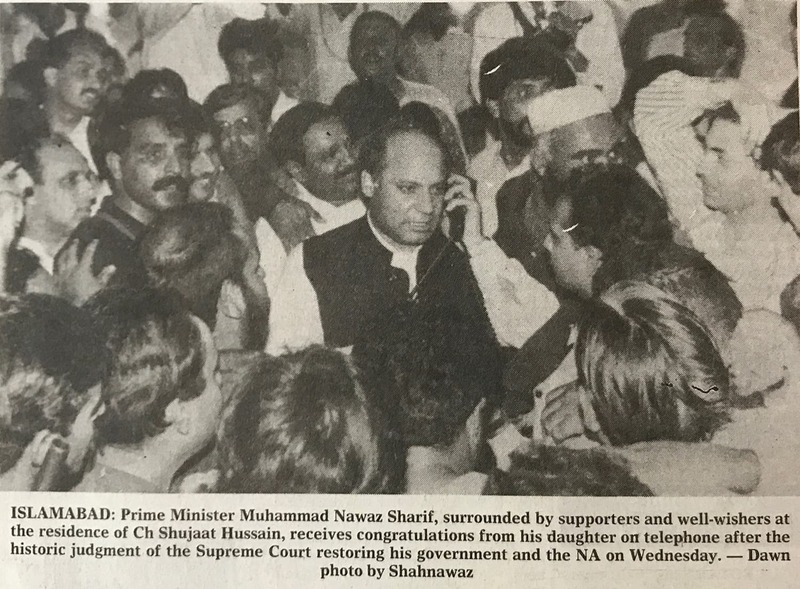 A month later, in May 1993, Sharif returned to power when the Supreme Court ruled the presidential order to dissolve the National Assembly as unconstitutional. After calling for fresh elections in 1993, Nawaz lost power to PPP’s Benazir Bhutto and took on the role of the opposition. Hussain says, "Benazir Bhutto’s return to power in 1993 elections owed it to the military abandoning support to Sharif. Another factor was the disintegration of the IJI." Nawaz’s second term as prime minister came in 1997 when the PML-N won by a landslide in the general elections. During his second term, he continued to be at loggerheads with the judiciary and in November 1997, during a hearing, a large number of his supporters stormed the Supreme Court building to disrupt proceedings. 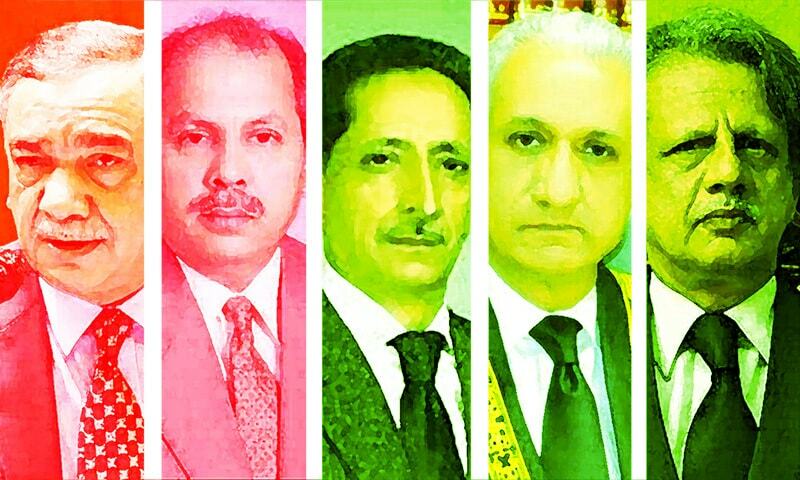 In this period of turmoil, Prime Minister Nawaz Sharif forced President Farooq Leghari to resign and Chief Justice Sajjad Ali Shah was ousted. "The game of musical chairs continued after the ouster of Benazir Bhutto’s second government as a result of her confrontation with the president and the chief justice. 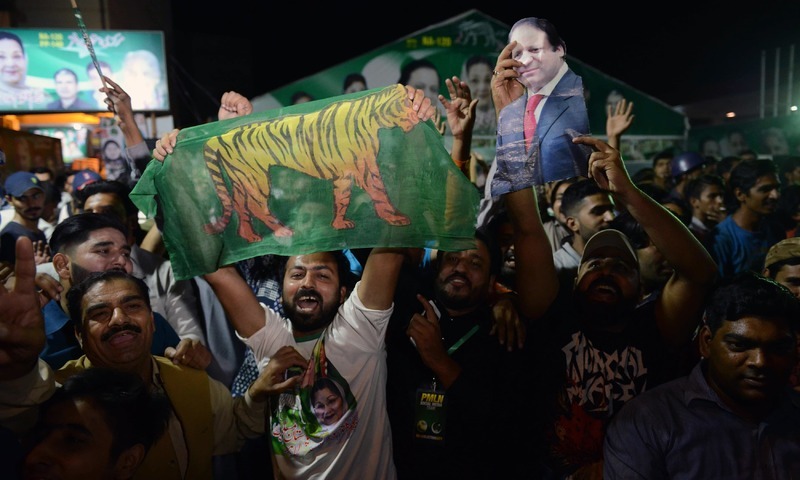 Sharif appeared to have won back the support of the military that contributed to his sweeping the 1997 elections with a record three fourth majority. But that alliance was short lived." In December 1997, PM Sharif announced that Pakistan would sign the Comprehensive Nuclear Test Ban Treaty (CTBT) only if India would sign as well. Pakistan successfully carried out its first nuclear test on May 28 1998, followed by a second on May 30. 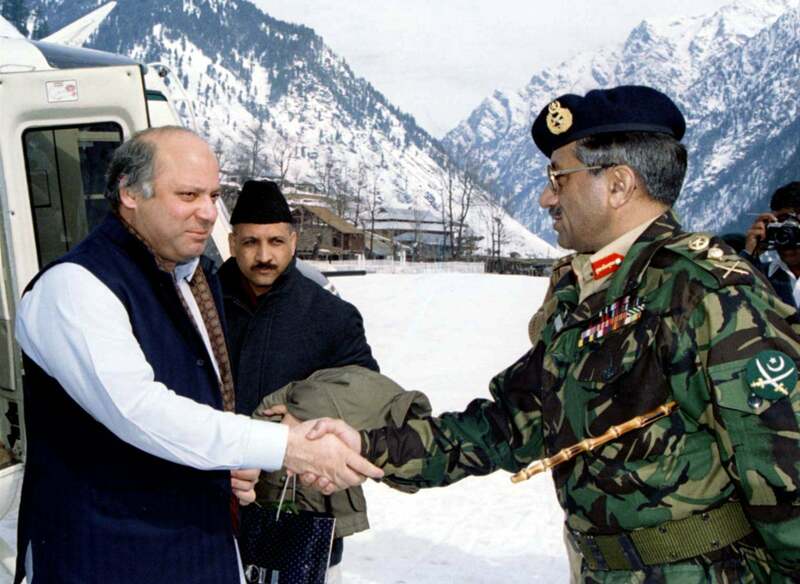 In 1999, as the situation in Kargil escalated, Nawaz’s relationship with the military turned sour. 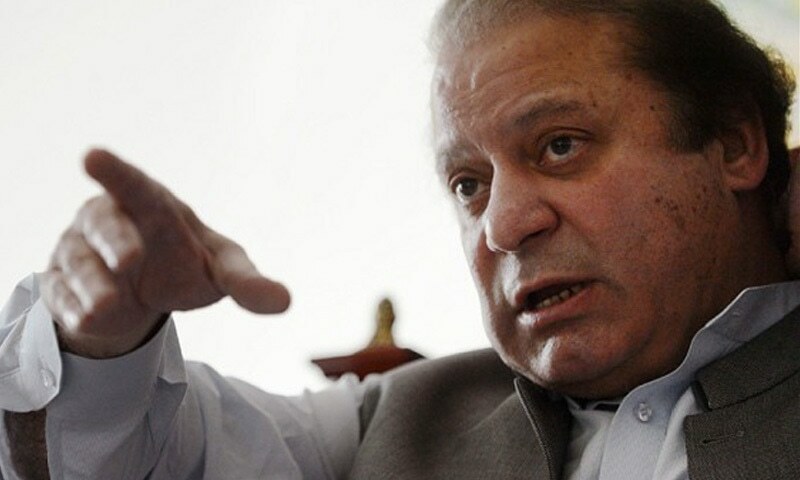 PM Sharif maintained that he had not been informed of the planned attacks in Kargil and that Chief of Army Staff General Pervez Musharraf acted alone. Two months on, PM Sharif had deteriorating relationships with the Army, Navy and Air Force, over his handling of the Kargil issue. The situation worsened, when in October 1999 PM Sharif attempted to remove the Chairman of the Joint Chiefs and Chief of Army Staff, General Pervez Musharraf. General Musharraf’s plane was denied landing rights at Karachi airport after PM Sharif ordered it shut, fearing a coup. However, the plane carrying General Musharraf ultimately landed in Karachi once the Army, upon earlier instructions, had seized power. "His wayward economic policy and his disregard of the institutional decision process got him into the conflict with the military. Later his attempt to improve relations with India and the Kargil misadventure also intensified the conflict with the Generals that ultimately led to the military take over in 1999." 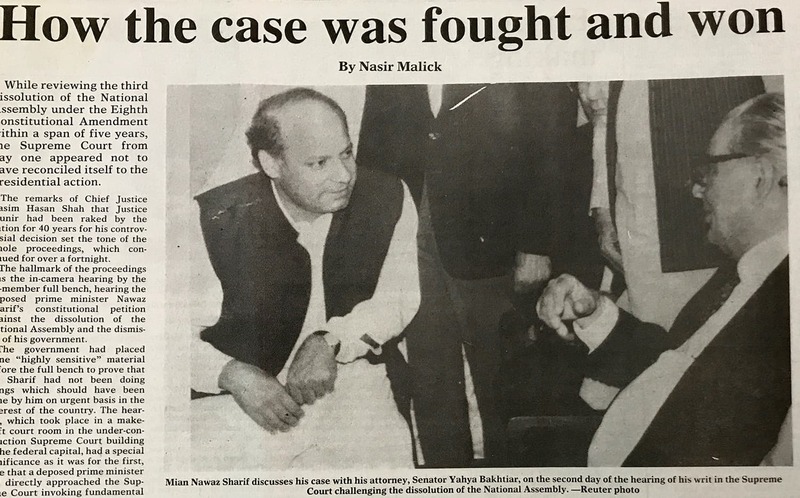 After the coup, Nawaz was tried in an Anti Terrorism Court for “kidnapping, attempted murder, hijacking, terrorism and corruption” and was handed a life sentence. Under an agreement facilitated by Saudi Arabia, Sharif was exiled from the country for the next 10 years. In August 2007, after years in exile, the Supreme Court of Pakistan ruled that both Nawaz and his brother Shahbaz were free to return to Pakistan. 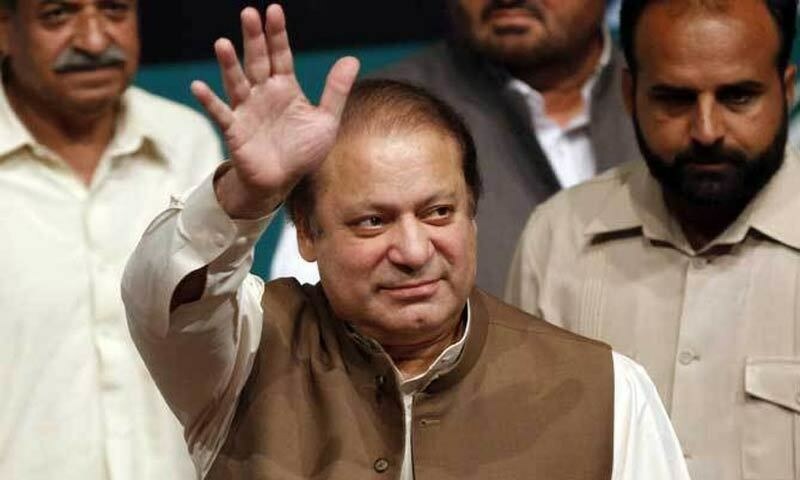 The following month, Nawaz returned from exile to Islamabad, but was prevented from leaving the plane and subsequently deported to Jeddah, returning instead in November to mark his return to politics. 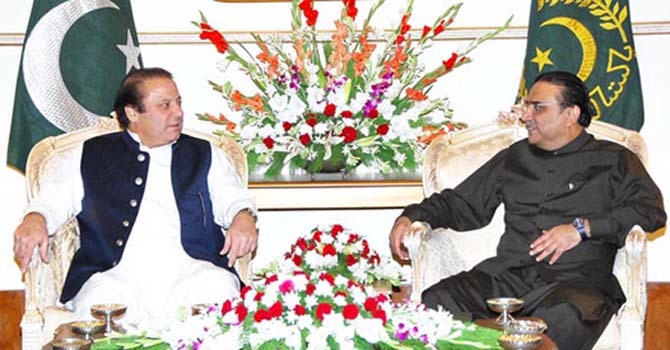 Between 2008 and 2013, Nawaz Sharif’s PML-N party had formed a coalition government led by the PPP. A Nawaz Sharif, Asif Zardari coalition is formed. — File photo. 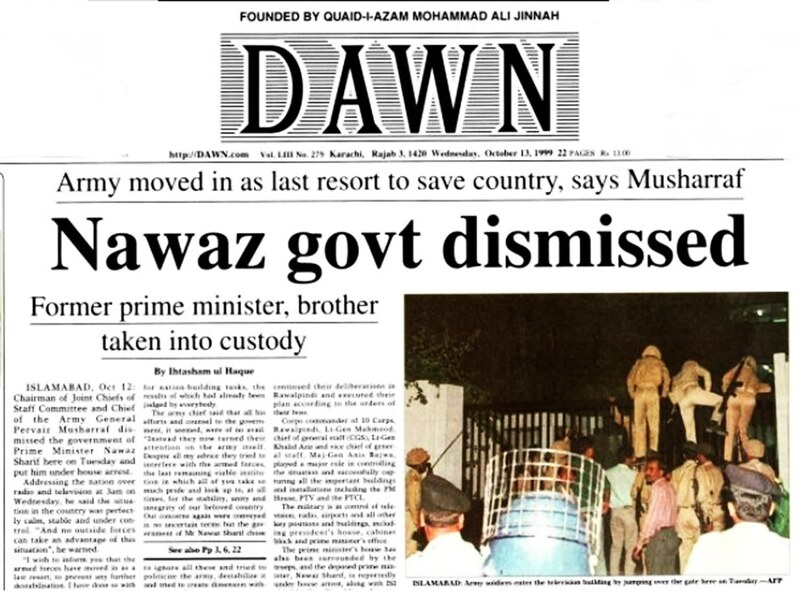 In August 2008, the coalition government agreed to impeach Musharraf, leading to his resignation. Later that year the coalition between PPP and PML-N collapsed over the former’s refusal to reinstate sacked judges. The Supreme Court of Pakistan disqualified Nawaz Sharif and Shahbaz Sharif from holding public office in February 2009. 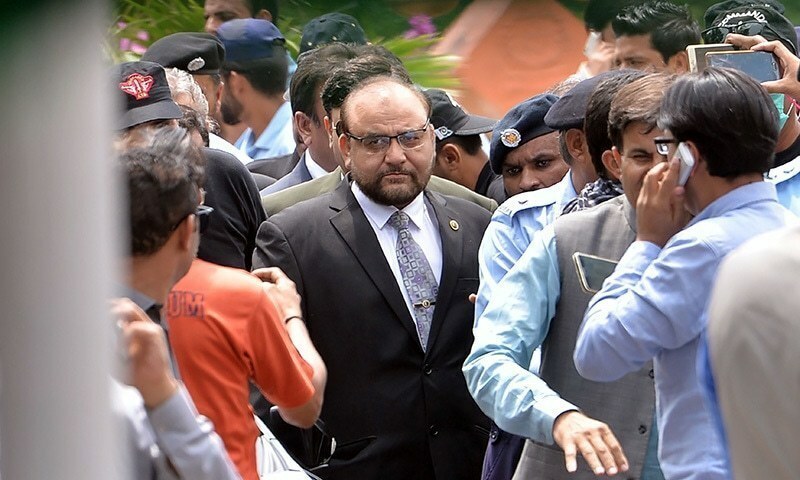 After Zardari’s attempts to place him under house arrest, Nawaz Sharif began a “Long March” with the aim to reinstate the dismissed judges the following month. In April 2010, the 18th Amendment Bill was passed, removing the limit on former prime ministers to hold office for only two terms, allowing Nawaz to run for office a third time. 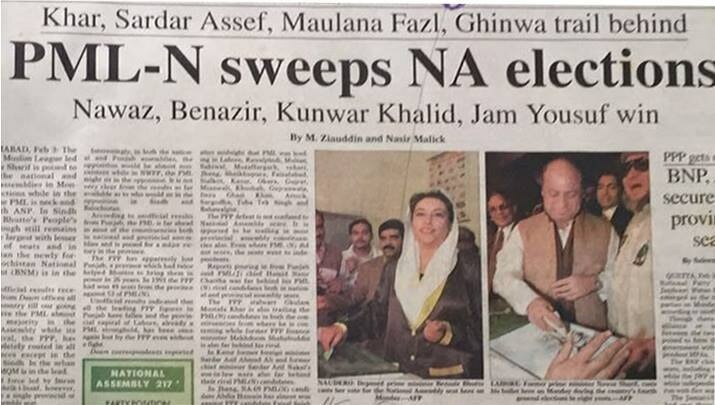 In May 2013, Nawaz Sharif was elected as prime minister of Pakistan for a third time, among claims of widespread rigging and election fraud. Pakistan incoming Prime Minister Nawaz Sharif. — File photo. The Sharif government backed a Pakistan Rangers led operation in Karachi, aimed at rooting out crime and terrorism from the metropolitan city. 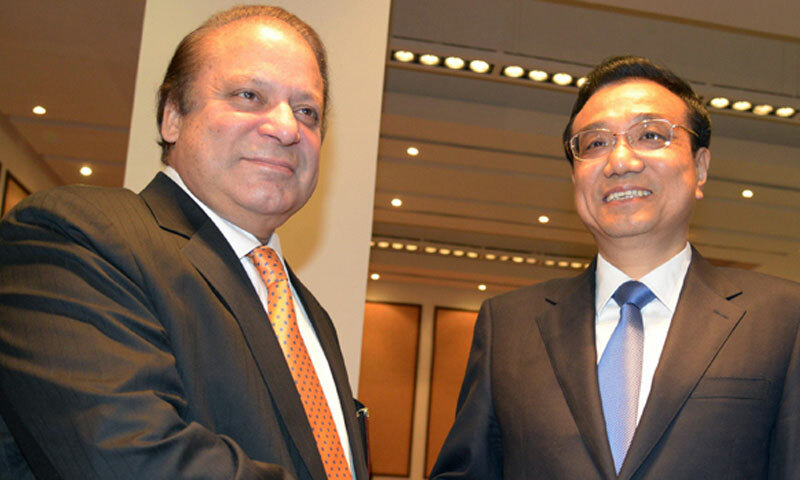 After a visit by Chinese Premiere Li Keqiang in July, it was announced that China would invest $31.5 billion in Pakistan. In November 2013, PM Sharif ceremonially broke ground on a $9.59 billion nuclear power complex to be built in Karachi. 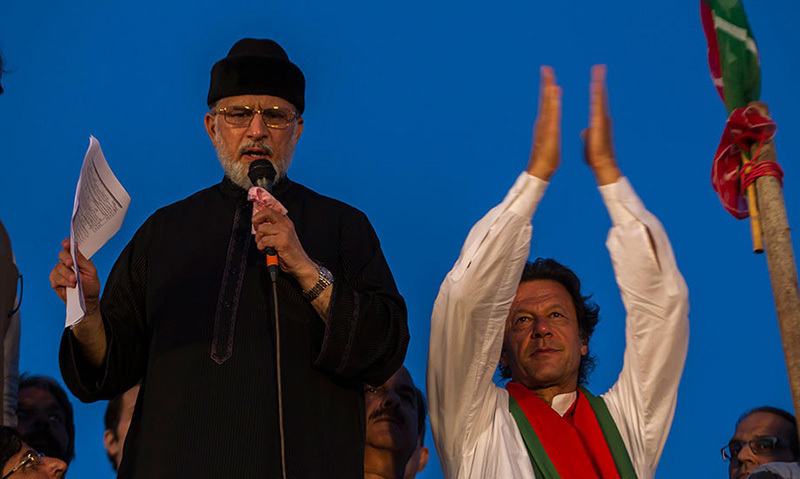 In late 2014, Nawaz faced mounting pressure from opposition parties regarding claims of rigging in the 2013 general elections. 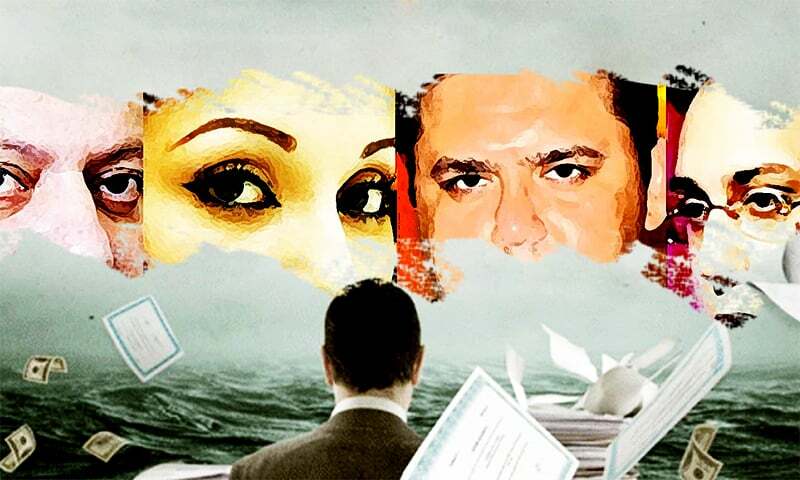 On April 4 2016, after the leak of the Panama Papers, Nawaz’s daughter, Maryam Nawaz, was identified as the beneficial owner of two offshore companies. In October of that year the Panama Papers case was taken up by the Supreme Court of Pakistan to investigate claims of money laundering and tax evasion by the Sharif family. After announcing their verdict, the Supreme Court ordered the formation of a Joint Investigation Team, which found PM Sharif to be the chairman of Capital FZE, a Dubai-based company. Following the findings of the JIT, the apex court bench analysed its report and reserved its ruling on the Panama Papers case. On July 28, 2017, the bench disqualified Nawaz Sharif from holding public office. The court ordered the Election Commission of Pakistan to de-notify the prime minister from his National Assembly seat to fulfill the technicalities of implementing the order. The Supreme Court said the ECP should de-seat the PM for not disclosing his role in the Dubai-based Capital FZE company in his nomination papers, saying that this meant he was not 'honest' and 'truthful'. The decision brought to an unceremonious end Sharif's third term in power, roughly one year before scheduled general elections which would have seen him become the first Pakistani prime minister to complete a full five-year term. In September 2017, Begum Kulsoom won the by-election for NA-120 Lahore, the seat vacated after the ouster of her husband following the Panamagate judgement. Weeks before the by-poll in which she narrowly defeated Pakistan Tehreek-i-Insaf's candidate, Kulsoom was diagnosed with lymphoma, a type of cancer that starts in the lymph nodes. She then went to London for treatment. Nawaz was removed as PML-N head in February 2018 after the SC struck off a controversial amendment to the Elections Act, 2017 which had paved the way for him to resume leadership of the party following the Panama judgement. The court said that it is mandatory for a party head to fulfil the requirements of Articles 62 and 63, as a party head is powerful and political parties control the government. 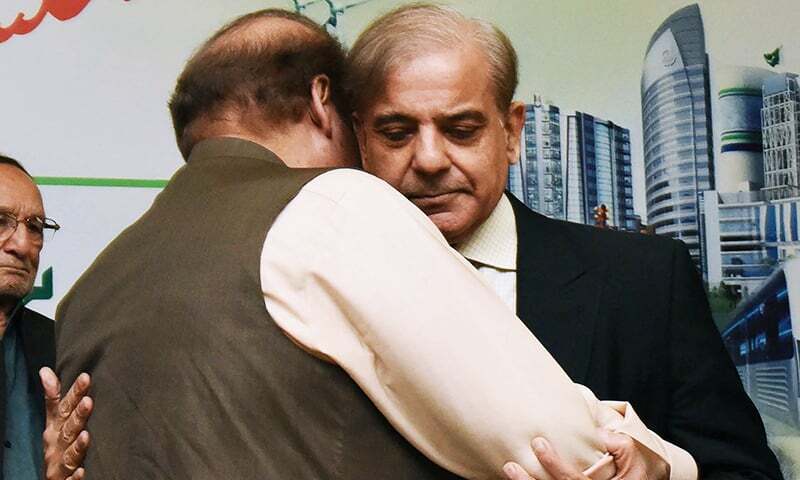 Soon after, Shahbaz Sharif was elected unopposed as the acting president of PML-N while Nawaz Sharif was elected as "[the party's] Quaid (leader) for life". In a landmark verdict on April 13, the SC ruled that disqualification handed down under Article 62 (1)(f) of the Constitution — the same provision under which Nawaz Sharif was disqualified on July 28, 2017, in the Panama Papers case — was for life. Following the verdict, Sharif became ineligible to ever hold public office. The decision stated that the disqualification of any member of parliament or a public servant under Article 62 (1)(f) in the future will be permanent. Such a person cannot contest elections or become a member of parliament. On July 6, 2018, the accountability court in Islamabad convicted Nawaz and his daughter in the Avenfield reference. Nawaz was handed 10 years in jail for owning assets beyond income and one year for not cooperating with NAB. The former prime minister was in London, tending to his ailing wife, when the verdict was announced. His daughter Maryam was handed seven years for abetment and one year for non-cooperation. Nawaz's son-in-law Captain Safdar was given one-year jail time for not cooperating with NAB. Hours after the Avenfield case judgement was announced, a defiant Nawaz announced in London that he would return to Pakistan to "face prison". Exactly a week later ─ and just days short of a year after he was ousted from the prime ministerial office ─ Nawaz and his daughter returned to Pakistan from the UK, where they had been tending to Begum Kulsoom as she underwent treatment for cancer. 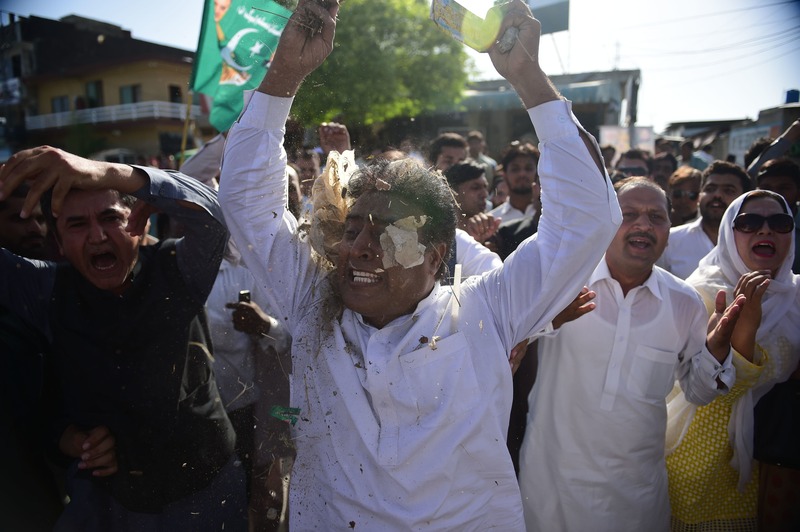 More disappointment followed for Nawaz, as his PML-N party not only lost its majority in the National Assembly in the 2018 general elections, but it also failed to form government in its stronghold of Punjab. About two months after being jailed, Nawaz and his family members were released on parole for five days after Kulsoom passed away. 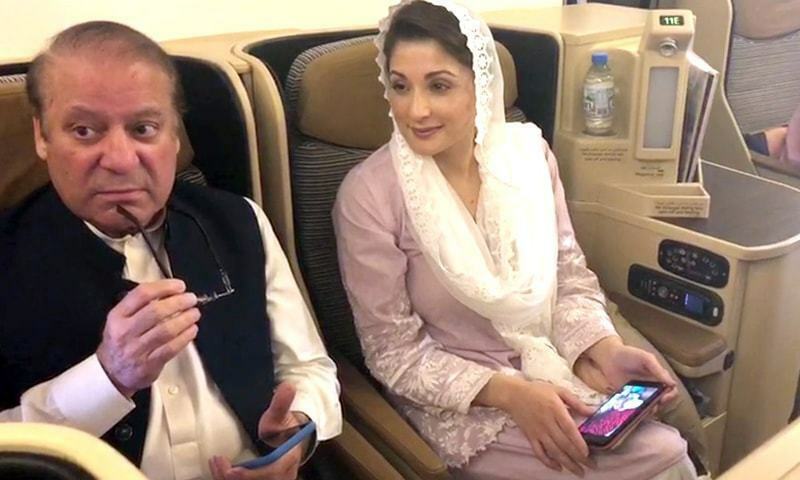 Two days after they were shifted back to Adiala Jail when their parole ended, the Islamabad High Court suspended the sentences given to Nawaz, Maryam and Safdar, releasing them on bail. NAB challenged the IHC verdict in the Supreme Court, which accepted the bureau's appeal and ordered the constitution of a larger bench for regular hearings. On December 19, 2018, an accountability court in Islamabad reserved its verdict in the Al-Azizia and Flagship Investment references against Nawaz. The two references against Nawaz and his sons, Hussain and Hasan, concern the setting up of the Al-Azizia and Hill Metal Establishment in Saudi Arabia, and Flagship Investment in the UK. However, Hussain and Hassan were declared absconders by the court after they did not join NAB’s investigation. The court subsequently charged Nawaz in both references under Section 9(a)(v) of the National Accountability Ordinance, 1999. 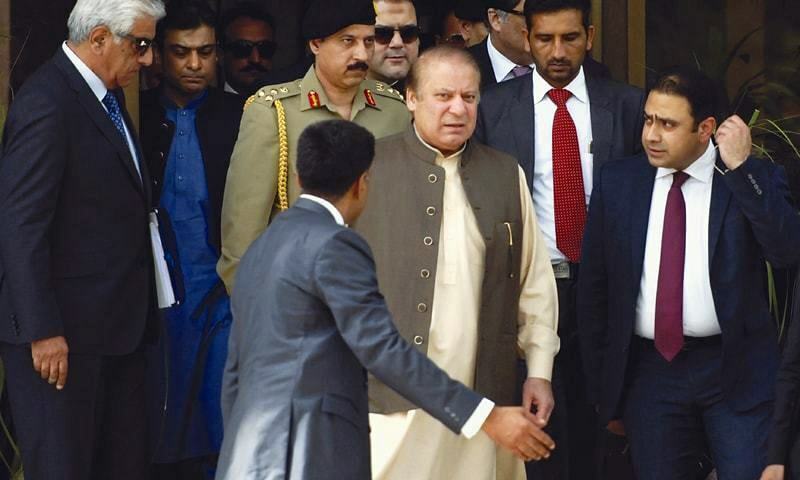 Judge Mohammad Arshad Malik announced the judgement in the two cases on December 24, handing Nawaz seven years in jail in the Al-Azizia Steel Mills corruption reference, and acquitting him in the Flagship Investments reference. The court ordered that his properties be seized. We never learn from History! "Men may come, and Men may go, the World goes on for Ever"
Mr. Nawaz Sharif give Pakistan some stability. The making and soon the fall of Sharif dynasty. The Fall of Sharif Family Empire is what you should be writing about. It was a house of card, built around fraud, fabrications, wrapped in lies and kept standing until the Wind from IK bowled them out! This is third time when the nawaz shairf was made PM of the country but report speak that aksari wing played important role to make him prime minister, shows he is not really public leader but he is leader of elite class. his focus is only punjab there is no development work in the other parts of country except Punjab. At present there is national leader in the country all the regional level politicians which is very dangerous for the country as the country is crossing from very serious time. In our country politics has been lucrative job. all politician has been billionaire. Their poor policies caused weak of the state institutes. there is no merit in the country. People are identities by talking their regional languages but we all are pakistani and we should introduce ourselves int the country as pakistani instead of punajbi, sindhi, pushtoon, balochi but the poor policies of politicians supported by establishment have distributed the nation among small groups. Despite that Nawaz has never been given the opportunity to complete his term, he has done more for Pakistan than any politician. Great leader of Pakistan. Where there is no fear there is no justice so far we think justice is done but lot more.... if we have to walk with the rest of the world. I always hope for the best for Pakistan but unfortunately we do not learn from our mistakes, but again hope this time. Justice has been done finally. The history repeats itself every time it is forgotten. That other group was not 'Batala' it was BECO, Batala Engineering Company founded by CM Latif in India and then moved to Pakistan. BECO was nationalised by Bhutto and even though Nawaz Sharif could've returned it to CM Latif during privatisation years, he didn't because BECO was a giant competitor. It was NOT the Sharifs that were futuristic but CM Latif. I have repeatedly heard Sharifs claiming that Ittefaq Industry was a towering industry, IT WAS NOT. BECO was that industry. Ittefaq Group had a meagre shed in front of BECO. It was BECO that was Pakistan's greatest industrial success story with offices in London and New York but destroyed at the hands of politicians, not Ittefaq. The other group mentioned in this article was not 'Batala' it was BECO, Batala Engineering Company founded by CM Latif in India and then moved to Pakistan. Please update this information. It is shameful that analysts are unable to do their job correctly and report correct information. BECO was nationalised by Bhutto and even though Nawaz Sharif could've returned it to CM Latif during privatisation years, he didn't because BECO was a giant competitor. It was NOT the Sharifs that were futuristic but CM Latif. I have repeatedly heard Sharifs claiming that Ittefaq Industry was a towering industry, it was not. BECO was that industry. Ittefaq Group had a meagre shed in front of BECO. It was BECO that was Pakistan's greatest industrial success story with offices in London and New York but destroyed at the hands of politicians, not Ittefaq. This verdict will live and be spoken about , until the day of judgment. I wish the all the powers within the country, deal with the issue once and for all, so these character's are not able to raise there heads and represent us as our national leaders. they should be exposed for what they are ,and not be given a platform to exercise influence, nepotism and corruption which does destroy any country. we area nation proud and should be respected in the global village .Pakistan Zinda-bad . SC keep this practice continue. State of Pakistan comes first not personalities. Personalities will die not Pakistan. Sharif family one o the richest family of Asia. Nawaz will be remembered as a great leader of Pakistan. Despite he has never been given the opportunity to complete his term, he has launched and completed more mega projects in Pakistan than any other elected or nonelected leader. Good for democracy in Pakistan. 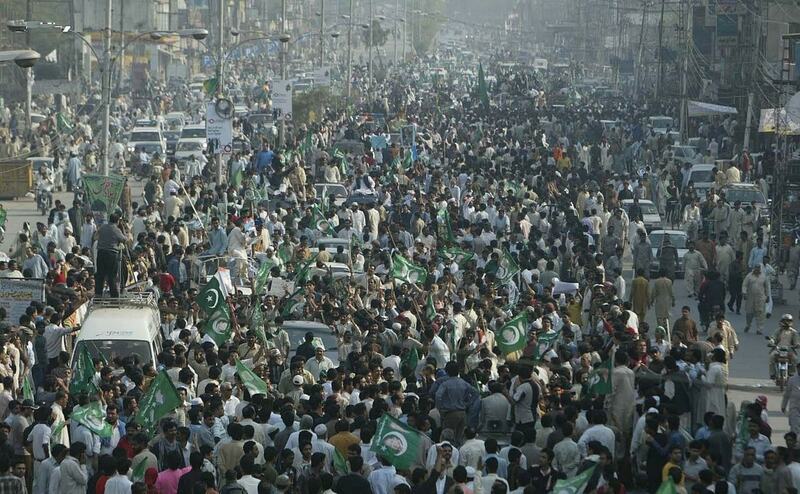 The faith of the Pakistani people in judiciary has been further strengthened. There is some invisible force in pakistan which sees to it that "powerful" men who occupy the chair are forced to go or their tenures are cut short! It started with Liaqat Ali Khan and now continues with Nawaz. God save Pakistan. Shukria Wajid Zia and all the judges. Prayers for an honest and sincere leader for Pakistan! Great News!! Pakistan has a future now. So, History repeats. Pakistan in 70 years, No any one civilian prime minister completed five year tenure. There is no other alternative for corrupt democratic system, because people are part of it. We can chose, blame, change, vote, debate, fight, campaign, but it is all in people's hands. This imperfect system has been there for years, if you are lucky and have good connections, you will survive. If you lost those powerful connections, you will be completely lost. Pakistan should congratulate Mr.Nawaz for his contributions to the country. It is not difficult to rule the country like Pakistan, when other powers are more powerful than political system. But he tried his best for the country, everyone admire him including across border. Even at the height of the conflicts and differences, he has close Indian friends in life. That is a best balance. Best wish to Mr.Nawaz and his family. the Sharifs are the upcoming stars of the "Hall of Shame"
Let history judge whether all this accumulation of wealth while in office was worth it. In Nutshell it is how a common man be fooled and deceived under the cover of development, security and politics again and again, consequently reaping dividends even if being in and out of Power. Neither the family was tody of British nor industrial by birth. By sheer hardwork they established their business.It is sad to see very harsh decision against family, when big looters are roaming around and pose innocents. @Hunain khan , sir. My father once held the post of Deputy Iron an Steel Controller, issuing all kinds of steel import permits. 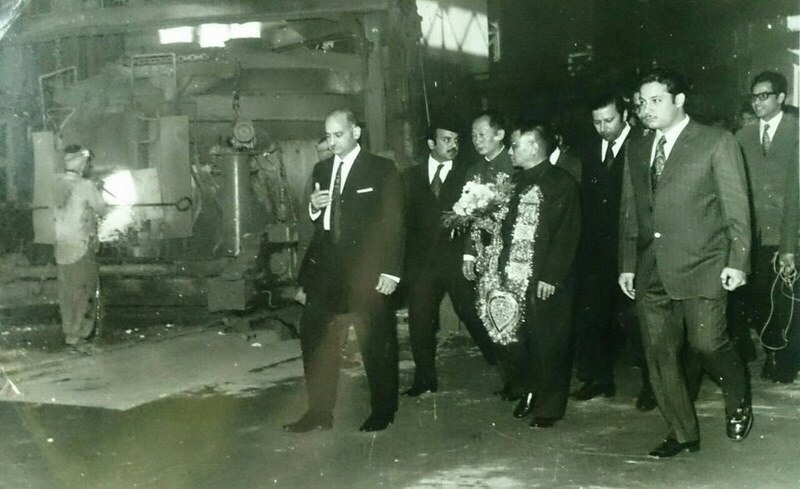 As a child I remember visiting the huge Beco factory , making bicycles and machine-tool lathes,with him in Lahore. And also a small workshop shed where workers were beating panels manually. Mr Sharif opened the car's door, and we got the Ittefaq calendar as a gift, showing some Victorian era water pump which they manufactured. Lets hope that it should be in good faith of the our beloved country... We want prosper and progressive Pakistan like other developed countries. Nawaz Sharif will be remembered in the history as the chorr of Pakistan. But he can change this by returning all the illegal wealth he has accumulated. Greed is human, after learning the truth and repent. this Nation may pardon him. Now the ball is in Nawaz's court, to go in the history as Chorr or a good guy who admitted his faults. I do not think Nawaz will ever read my comments, but if any of his siblings read this please give him my message and let him come clean in this world and in front of almighty. In one of the picture with his kid he is looking super cool. Nice . But i am not impressed . He (Nawaz Sharif) and PPP govt. crippled Pakistan in the past 40 years. I fear this would be the founding step towards dragging the nation soon towards dictatorship.... Well Orchestrated! unprecedented ... but I hope Pakistan will not be the loser in the end due to all this power struggles! there can be a full feature film out of this... Panama say Aqama tk (Panama to work Permit)... a Journey of shame. A great leader has been lost. A great victory against corrupt and greedy politicians of Pakistan. This decision is going to be a game changer and a better and honest leadership will emerge after the historic decision by Supreme court of Pakistan. The process has begun, clean up the corrupt. It is still a long journey. Disqualification of Sharif is the right step forward. This isn't the end, although i support disqualifying NS, but this judgment opens a Pandora's box. Now PTI is after Khaqan abbasi & Hanif Abbasi. Jehangir Tareen and numerous other PTI old& news members aren't so innocent either. Then we have MR 10% (Zardar & goons.Inc). Where will this lead us, another martial law?? not good for a poor country struggling hard to fighting terrorism along with poverty and destabilization. @M. Emad The cost of that stability is too high that you tend to lose Pakistan paying for stability. It is right that noone is above the law and that all citizens of Pakistan should be capable of being held accountable for their actions irrespective of the office they hold, but true well wishers of Pakistan realise that the true purpose of de-seating the prime minister is to try to stop Pakistan's fast development of the last few years. This is not about honesty and corruption it is part of a conspiracy to prevent Pakistan rising. But inshallah the enemies of Pakistan will not be successful. also if you take out hard earned money from businessman and their family by bogus setups like 'nationalisation' and sucking socaialist ways of bhutto (may be unsuccessful and jealous) you would end up in such mess as businessmen would now devoit their attention to power.. let businessmen thrive only they can help economy grow not govt. Becoming three times a PM is not enough?? Leave Pak for the sake of young generation. This is how I look: PAST - is a history that provide us an opportunity to learn from our mistakes, PRESENT - give us an opportunity to face facts and act constructively for betterment and FUTURE - is unknown, only our Almighty knows, what is good and bad for us. If you are elected PM thrice and disqualified/ousted thrice, then your are not unlucky....you are plain and simple incompetent. If Nawaz is replaced by his brother then what has been achieved. It is tragic for democracy that a convicted person is replaced by a similar person who happens to be a close relative. It all sounds famliar. Believe me or not he will be PM again and Darty politics never end either. The rulers come; consider themselves indispensable; but when time to go arrives indispensability disappears with them and false sense of indispensability accompanies the new leader. So the lust for power never allows them to stay grounded and stay sane. 'The Emperor's New Clothes'. Probably a jail uniform, which may not necessarily imported from England. So long. All those shopping for luxuries on Bond Street and Knigtsbridge are over for King Nawaz. @rich agree with you. Lets wait time will tell about SC decision. Nawaz Sheriff and other elite class know well that; if the judge is not favouring then BUY prosecutor (if you fail to nib), then kill the witnesses. Ayan case you know they killed the Police Officer who was actively investigating. There are hundred of such cases. This time, Nawaz totally failed to get favour from Judges, Prosecutors (JIT) and +. That is the reason he badly failed. But Pakistanis are a weak nation and they cannot scrub the dirt. This elite class has tons of money while poor Pakistan will cast their vote at a simple price of cup of tea or Biryani Plate. Now Shahbaz Sheriff is likely to be nominated as PM. 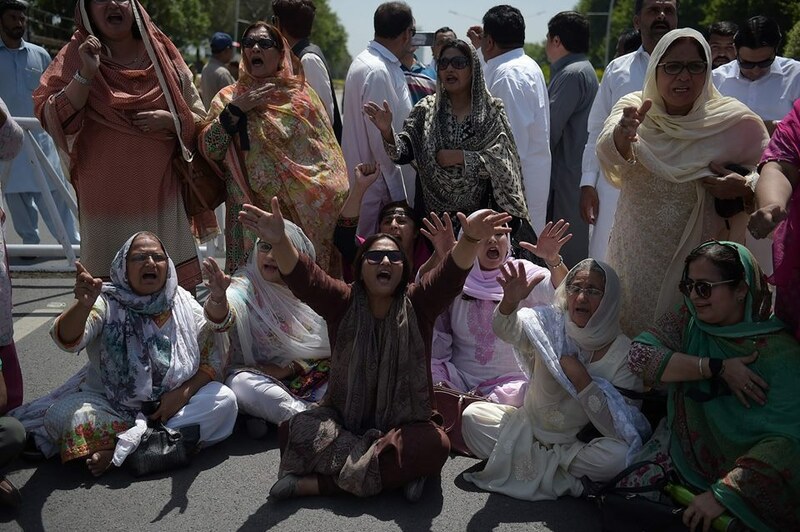 Where is Nawaz gone. No, he is not gone. Next time, Bilawal Zardari will be one. You cannot change these people. he was born in amristar. If we are to learn from history, nothing to worry. The intelligence institution and the boys will step in to create a stable party that will rule at their beckoning. I hope Pakistan elects Imran Khan as a new prime minister of the country. We as a Pakistanis should give him a chance. He will do good for Pakistan. It is a much needed step !! One doen. The Rest to go. The fall part is a bit immature. He can always come back, even in the background. Besides the show on Imran's offshore shenanigans has still to fall. @M. Emad As a nation we have no patience at all, when we like someone, we put on our shoulders but in no time we like to get rid of them. Not only that there is always conspiracy behind rise and fall of political leadership. The problem with Mr. Nawaz Sharif is that he does not learn from experiences. If he can't protect his position then how can he protect the country. I am sad that like other statesmen, Nawaz was also given ample opportunities to set himself as the second Quaid-e-Azam, but he failed. An asset is recognized when received, it is a simple accounting principle of revenue recognition followed by individual tax payers. The same when followed by Mr. Nawaz Shariff has not been accepted by Supreme Court Judges. Highly deplorable. Perhaps, some of the CPEC money didn't reach enough generals. Looking at the JIT team, two from military side and one from pro-military side. guess the game was already stacked against sharif. feel sorry for him. When the money laundering, tax evasion and corruption are led by the leaders; then they become nation's" loaders" therefore they can't expect from other people to be honest and pay taxes. Nawaz Sharif and Zardari have set in new rules of governance which sanctify corruption with impunity in the name of mandate given by the people of Pakistan. For achieving their end each Party has established a mafia in the Civil services gelled together by mutual benefit. They cover up the thefts, grafts, commissions and leave no trace. Credit goes to Supreme Court for correctly assessing the situation and standing with Pakistan and its deprived citizens. Its only the new normal that Pakistan can be taken out of the clutches of God Father. Pakistan steps forward towards end of family politics and surge of real democracy...thanks SC and JIT. Nothing new in pakistan history . When our leader itself is corrupt, what more can you expect from the Citizens. After going through this piece, it really astonishes me how such a mediocre person, who has now been proved to be a liar, corrupt and fraudulent to boot, rose to the heights that he did! Does it not speak volumes for the rottenness of our system that such men manage to rise to the top echelons of government? Ouster on a technicality not on corruption. Must have been orchestrated by illusion of the powers behind the throne who have n axe to grind against Man sahib. @M. Emad 'stability' in the highest borrowing from IMF , in countries history. @rich it is your logic which has kept the country down. Have an honest leader, see how the country progresses. This is a great development in the neighboring country in terms of corruption. Hope the political stability arrive soon as it is the most necessary thing for a country's survival. Life gives chances again and again. But it is up to human himself whether he/she corrects his / her mistakes or not. Mr. Nawaz Sharif is the one who didn't learn from his mistakes and once again he has been expelled from PM office in disgrace. Such a shame for him in not completing tenure for the 3rd time !! I am at a fix whether it is a mention worthy event for a journalist, that Nawaz Sharif less than a year after Benazir Bhutto came to the power second term, had organized a long train march on Sept. 11 from Karachi to Peshawar via Lahore a 2day country wide agitation programme. That coincided with a special OIC foreign minister conference .I covered the conference,later also covered the train march as an only foreign journalist.Many foreign journalists approached but their request were not maintained. The workers ,leaders including Mr. Sharif and the people gathered given me invaluable scope to know a country in an unique way.While returning Bangladesh (let)Mustafizur Rahman then foreign minster and a former Pak army lt.Col. invited me to give my tour experience.As I told him from outer signal to Multan rly station an 1minit.distance train took about an hour.He excalimed" my God Our Commission sent a report that Mr. Sharif has less following.The minster than left the chair! @anwarsher But the country's Supreme Court thinks he was a corrupt leader. No Civilian Govt ever could serve for full term! It is an biography of Nawaz Sharif, but country's debt is rising forever and the standard of living of people is blow from poverty line. What kind of these politicians are? I could not ever understand, are these politicians sincere to our dear homeland Pakistan? It is apparently a story of struggle between luck and incompetence, where incompetence had the last laugh. I am not sure why Mr PM didn't learned from his past? I am sure if he would have initiated public sector projects like schools, healthcare, with no tolerance over corruption and nepotism the results would have been very different. What a pity...three times PM...and yet condition and problems of the masses remain unchanged! His one mistake from becoming a power figure, respected and feared by all, was his indecisiveness against the Khaki. @anwarsher A person who has not done any marvel during the last 4 years what could he achieve apart from strengthening his hold on to power for his family by devious means. Always disregarded merit and expected loyalty from inexperienced official but smart in false fabrication of facts and statement. Thanks heaven we have got rid of him. The country is in a much better position than it was 4 years ago. @M. Emad Yes he gave Pakistan stability when he resigned. It is all a staged drama managed by the invisible deep state of Pakistan. No leader is allowed to be powerful enough to challenge the deep state. It's all a sham... The real power is in the hands and drawing rooms of rich powerful boys. Thank you for this well researched post. Kindly correct the typographical errors in the article though. This time his (NS) governance was much improved. May some bad deeds earlier let him drowned. Yesterday, I was positively looking forward for the speech of Imran Khan, but much frustrated now that he is forgetting some basics, though his stand against corruption is vibrant, but in parallel he should guide and counsel, present a plan in building a socio-economic development/culture in society. Un-fortunately, still we are lacking a complete-packaged-leader in our society to focus in all quarters equally. Leaders should unite and lead, instead of being arrogantly-aggressive. Still, best of luck to IK, hope he realized. Mark it as Raise and Fall, he has fallen till the end. @Asif .. where will the kids work after they get out of school.. .. .. industry, construction, brings jobs... ..use the common sense.. There Leaders even die but World never stops . So why PMLN not accepting the truth and let the country move on ? Like many other political figures and Waderas, Nawaz Sharif never understood the meaning of term "conflict of interest." He never tried to learn any lessons from his past mistakes, his ego reached cloud nine and finally led to his political demise! What do you mean? Let him keep what he stole from the people, so he would stop his corruption and not steal any more. Forget it my friend once you taste human blood you never stop. I just hope and pray that we have seen the last of him and his shamelessly corrupt family. @Asmat Jamal . Well said, agreed 100 percent. Obama was president for 8 years and now he is no longer is in the news or in the limelight but the world goes on. Problems start when people refuse to go and insist on being in the limelight forever. His whole political career was based on wheeling dealing, catapulted to the seat of power by military dictator Zia ul Haq, ultimately pulled down by another military dictator Musharraf. The man had no vision for the country. 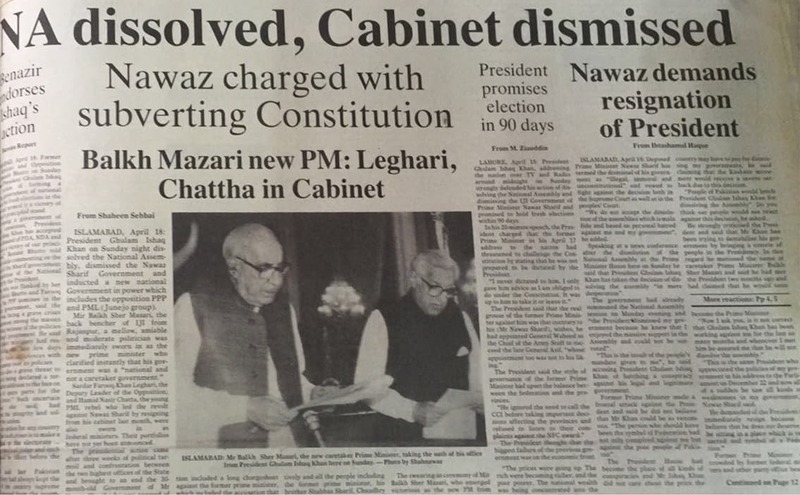 ZABhutto though decidedly arrogant had vision and charm, Nawaz Sharif had none. Nawas is fallen and out but who is the other option. Pak has tried Zardari but PPP does not know how to govern. Imran Khan knows only dharnas and protests. 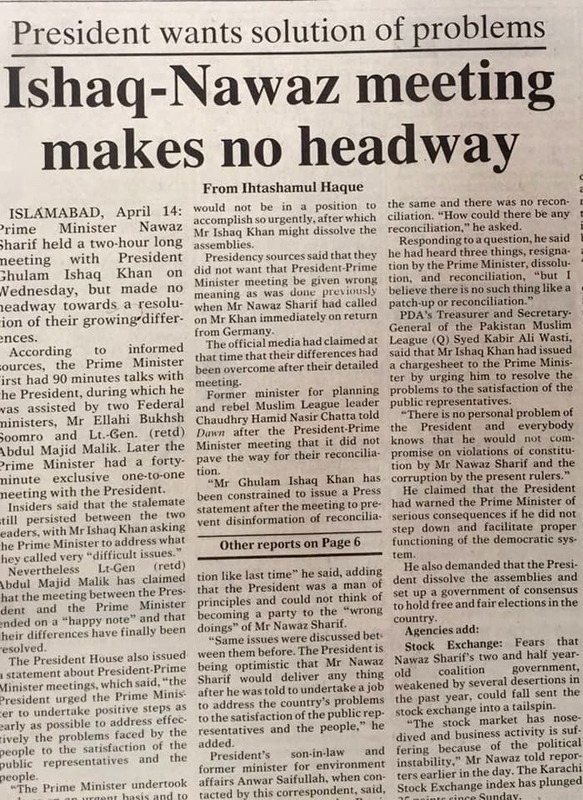 The only viable option is the present PM Abbasi. @anwarsher Was the leader of Pakistan, its past tense. He may have done some good things for Pakistan, but he did many many better things for himself. Nawaz shareef had no fall. NS, just like many other shrewd criminals and frauds, entered politics to con Pakistanis and make money. NS succeeded in conning Pakistanis since 1980 and since then, he looted enough that would last his many generation. In recent event, he got some setback, and thus may not be able to loot as much as he was doing in past, but as it seems, his conning the nation may continue for a while. Now, he would use his cronies to con Pakistanis and loot Pakistan. "His father was a wealthy industrialist and had founded the Ittefaq and Sharif Group". NEEDS some daring correction as far as the word wealthy is concerned. The biggest problem in our nation is still feudalism, which in India was abolished by Indira G. Until that happens our democracy is never going to be on grassroots level. What he has sowed, he has reaped. Voraciousness and greed has become the main reason of his downfall. A historical verdict..! Good for Pakistan Are our political elite from all major parties willing to implement Sadiq and Ameen standard in their internal and external policies???? 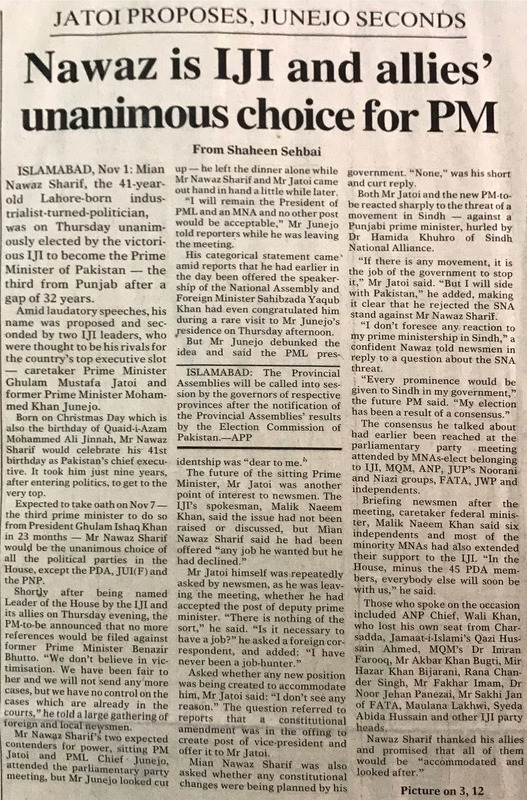 Will PML-N sideline Nawaz from party decision making??? Will Jehangir's influence be diminished??? Hoping for the good but it is never going to happen. Politics is a fruit punch - all fruits contribute and go away. Same is true for our sharifs (never sharif by the way). You have done your part and it is time to get lost. In this process if sharifs filled their pockets while we the people are dying at their doors - well let us just say "collateral damage". We have always been a "collateral damage". @anwarsher YES, in looting and on foreign loans, if he had completed this term, his plan was to declare himself a King of Pakistan because no one has ruled Pakistan or any other country in the world for 30 years except Kings. One of the greatest leaders of living history of Pakistan. He made Pakistan stable and powerful, gave us dignity and completely changed its outlook. He will be remembered for ever. @M. Emad what stability can you please define? I am convinced , in corruption matters, the Pakistan Judiciary is more powerful and assertive in delivering a perfectly fair verdict, than we have in India, where dynasty and positions are still heeded to. Hope the justice is served the remaining who damaged Pakistan. Good for democracy. Nawaz Sharif is no public leader. He was a Chief Executive of a family limited company named PML-N. We should carefully watch emerging leadership/rulers. Thanks NAB. @anwarsher, On paper, I'm a millionaire too, but in reality, I'm just as broke as the next guy. So Metro buses and motorways are the only highlight of his party. Lets look at the people of Pakistan, all over 200 million of them, about 2% got richer, including him, the rest, well they are still without bajli,, gas, clean drinking water, roti, kapra or makan thanks to PPP and PML-N. Leaders are born not made. NS was made. IK was born a leader. BB was not a born leader but had to work hard to become one. The rise of NS is inversely proportional to the rise of Pakistan. When he rose, Pakistan fell and now that he has fallen, Pakistan will rise. @M. Emad am sure he gave stability to your home as well. He was NOT at all the leader of the masses, the poor, the downtrodden. He was favourite of the elite. @anwarsher Or you serious or just joking or Christmas Time? Nawaz Sharif never learned from History. He was a Pakistani prime minister solely focused on Punjab which created alienation in the smaller provinces. Is there anybody to judge the judges?? The concepts of Progress and Democracy is important and personalities are relatively less important. Pakistan needs land reforms and heavy industrialisation. Pakistan should gradually become a welfare state. Personalities come and go. Serious reforms are needed in many facets of establishment along with politics. These include constitution, judiciary, military and bureaucracy among others. These require a sincere and dedicated individual. We had hoped that IK will do the require reforms but he has placed inept people to take care of the required reforms. Hence we are in the same situation as before ... ie. status quo. @Nisar Ahmad, Sir I am very sorry to see the shallow knowledge you have of this matter. The elder Sharif in the 70s decided indispensably, to restore & protect the family steel business through political power & NS followed the line till the end. @M. Emad, Then why don't you go and live with him in prison, you will feel even more stable. When we talk about a long era of Nawaz dynasty in Pakistan, we must not forget Pakistan which was on set of progressive and prosperous nation, this man has totally ignored or destroyed nation's economy and educational system. At the end of his era we stand at 163rd position of education and almost same ranking as far as economy is concerned. Alas! Actually he has come out swinging as an enemy of Pakistan! The Era of looting in Pakistan has definitely come to an end. With Imran Khan and honest man being in Power these crooks don't stand a chance anymore. Pakistan Zindabad.